Hover over the small images below to see more detail. 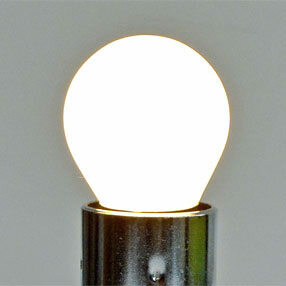 Special Offer Lighting Products and Limited Stock items. Our 'Last Chance to Buy' products are now low in stock and once they are gone - They're Gone - so bag your bargain while it lasts! All of our Special Offer items and discounted products are available for a short period of time only. Watch this space for regular savings on limited items. 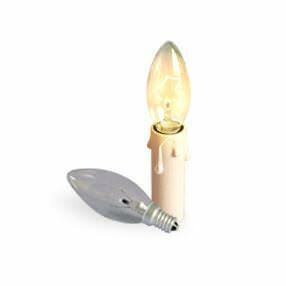 Dimmable candle bulb perfect for chandeliers and candle lamp holders. 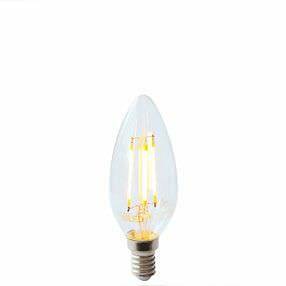 This stunning LED Small Edison Screw filament lamp bulb is 4 watts warm white with a 15000 hour life. Colour temperature is 2700 Kelvins. Lumen output 345. B35 shape. A+ rated. Mini golf ball shape LED lamp bulbs. Available in standard Edison Screw (ES) only. 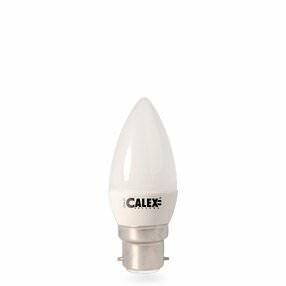 These small LED globes have a fantastic 20000 hour lamp life making them an outstanding energy saving bulb. Ideal for a table lamp. Only 3 watts. 260 Lumens with a colour temperature of 3000 kelvins. P45 shape. 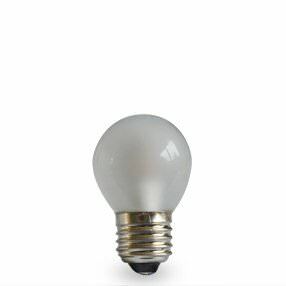 LED light bulb Golf ball shape warm white with a 25,000 hour lamp life using just 3.5 watts making these a truly energy saving bulb. P45 shape. Available in ES fitting. 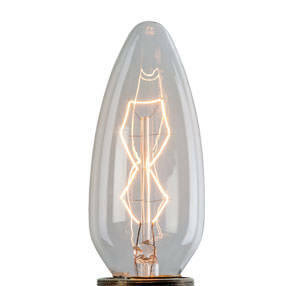 Beautiful church candle lamp bulb with decorative filament. 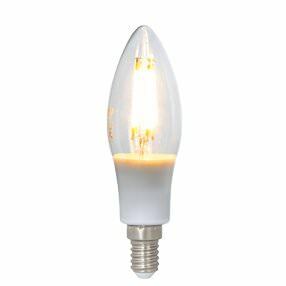 This incandescent standard Edison Screw cap candle light bulb has a 2000 hour life, is 60 watts with a colour temperature of 475 Lumens. Special Purpose: For decorative effect only; unsuitable for home room illumination. Traditional Small Candle Light Bulb. 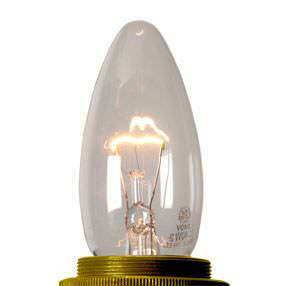 These clear incandescent candle lamp bulbs have a 1000 hour lamp life. Dimmable. Colour temperature is 2700 kelvins. B35 shape. 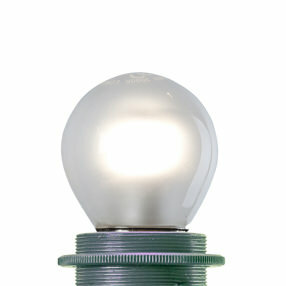 Energy Saving Edison Screw (E27) light bulb with less than a 30 second quick start glow time. Remarkable 10,000 hour lamp life. 9 watts. 480 Lumens. This bulb is not dimmable. Colour temperature is 2700 kelvins. 84mm high plain hand painted chandelier candle tube made of heavy duty card. 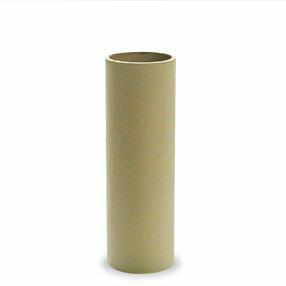 This candle cover comes in non-drip only in a creamy ivory colour. 84mm tall by 27mm wide. Made in the UK. 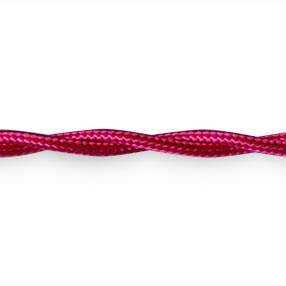 Vivid Pink 2 core twisted cotton lamp flex. 4.7mm wide this contemporary braided lighting cable has no earth and therefore is not suitable for metal light fittings. . 0.50m², 3 amp, 300v. Made to very high standards in the UK BS7655 & BS6500. 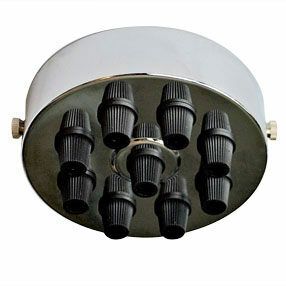 Chrome Shell shade picture light with flexible arm. 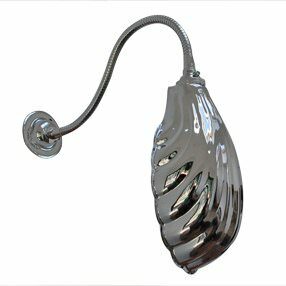 This wall-light complete with a clam shell light shade and bayonet cap bulbholder can be adjusted simply by bending the flexible arm. Supplied with 2 matching chrome screws. 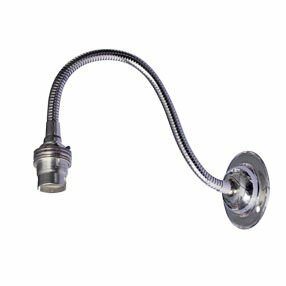 This light does not come wired lighting flex available from our flex page. Made in the UK. Chrome finish solid brass flexible arm wall light. This wall-light can be adjusted simply by bending the flexible arm. Earthed Bayonet Cap lamp holder fitting complete with 2 shade-retaining rings. Supplied with 2 matching brass screws. Made in the UK. NB: This wall light does not come pre-wired. Large brass lamp base chrome plated. This weighty 5" table lamp stand is made of solid brass and has a decorative bevelled design with a rounded ½" threaded central hole. Comes with a side hole complete with protective rubber bung for flex entry. Made in the United Kingdom. Chrome plated Harp. 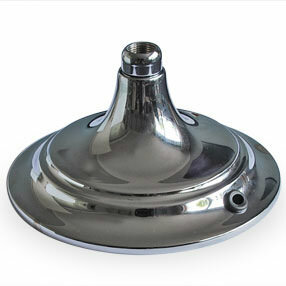 This can be used to carry a glass shade with a 1" top opening onto a table lamp. The base is held by your lamp holder shade ring. Made in the UK. Last one - A Beautiful Vaseline Glass light shade. 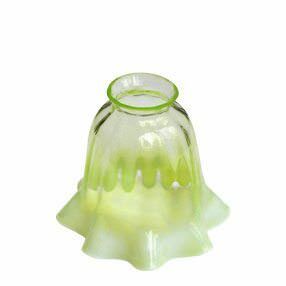 This small hand blown unique replacement glass shade has a 2" top rim to fit our 2¼" light galleries. 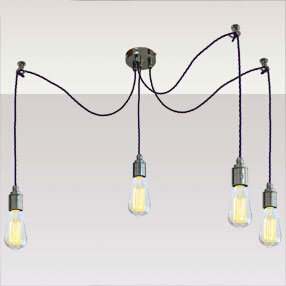 Suitable for a table lamp or single pendant lamp fittings. Our Galleries fit onto the rim, then just add a chord grip lamp holder a ceiling plate and some flex to create your own ceiling light fitting as shown. Quality hand blown glass made in the UK. For help & advice with hanging shades & choosing the correct light fittings please see our Light Shade Information page. Quadintuple cord grip ceiling plate includes 5 black cord grips. 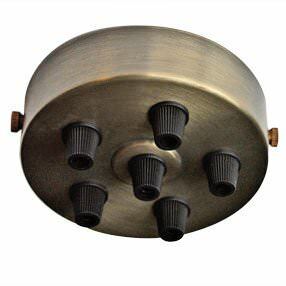 This large ceiling plate is made from steel with an Antique finish applied and has five black plastic cord grips. It comes with an internal ceiling fixing plate with earth tag, 2 screw holes and matching screws. For additional purchase or decoration add a large wooden pattress. Made in the UK. Multiple cord grip ceiling plate includes 6 black cord grips. 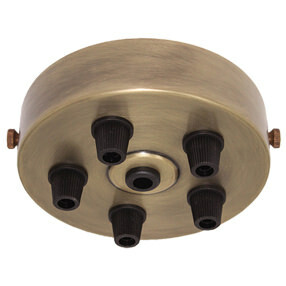 This large ceiling plate is made from steel with an Antique finish applied and has six black plastic cord grips. It comes with an internal ceiling fixing plate with earth tag, 2 screw holes and matching screws. For additional purchase or decoration add a large wooden pattress. Made in the UK. 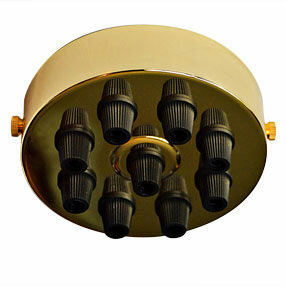 Polished chrome and brass plated large ceiling rose with 9 black plastic cord-grips. Comes with an internal attachment with earth tag for fixing to your ceiling. British Made. Dimensions: w=100mm, h=38mm. 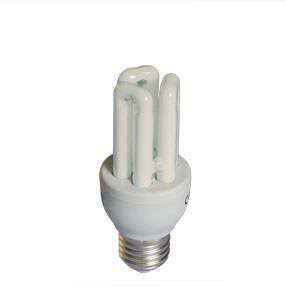 These LED Candle Light Bulbs have a whopping 25000 hour life. They use just 4.5 watts and are fully dimmable. Colour temperature of 2700 kelvins. A warm white. B35 shape. Moodshades. 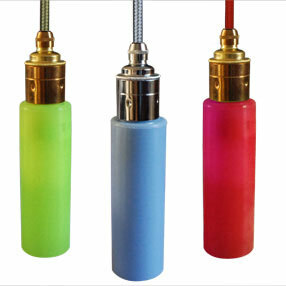 Durable silicone rubber bulb cover turns any energy saving lamp bulb into a soft coloured light. Energy saving Bulb included. Fits most Edison Screw lampholders. Made in the UK. Dimensions: 5cm wide x 15cm high.